If you’re in business, or if you’ve ever wanted to sell anything—then you’re in marketing. Heck no! I was an entrepreneur, dammit! Startups were cool, but marketing? Psshhh… That was for people who try too hard. And I quickly learned a simple truth. The most successful products and services weren’t the best in terms of value—they were the best because they were marketed the best. It’s estimated that by 2021 over 3 billion people will have profiles on social media sites, up from 2.46 billion in 2017. By the end of 2019, it is expected that over 3.9 billion people will have email accounts. And according to the Direct Marketing Association (DMA) research survey, 99% of all email users check their email daily. However, there’s a disconnect between these online marketing opportunities and reality. In a recent research survey, about half (254 out of 500) of small business owners didn’t have knowledge of digital marketing basics, like what is SEO. 18% more emails will be sent per day within 5 years. 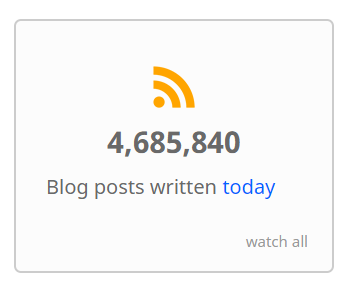 Over 4 MILLION blog posts are published per day in 2019 and rising. Digital marketing is becoming more and more complex. So the opportunity for growing your business with digital marketing is big, but you need the right knowledge to effectively compete. As a busy entrepreneur, I will give it to you in this quick and easy to read digital marketing guide. I’ll teach you key marketing definitions, so you know what everything means, even if you’re new to this. If you’re more experienced, this will be a refresher. I’ll show you what you should be focused on. I’ll prove how it’s based on bigger marketing trends happening now and in the future. I’ll give you my top digital marketing strategies and actionable tips. They will help you get started—even if you have no marketing budget. I’ll recommend additional resources and marketing tools that will help you get results faster, and with fewer mistakes. We’ll wrap up with my 11 point digital marketing success checklist, which you can download a copy of for free. Use it offline for your own reference, or share it with a friend. The online marketing world is changing and competition is increasing. This quick-start guide will show you how to compete and win—in as little as 15 minutes. click here and I’ll send it to you. Digital marketing is the same thing as online marketing or internet marketing. It’s the act of marketing your business, brand, products or services on the web. These are all common elements of any successful business’s marketing funnel mix. A series of steps designed to lead a potential customer from awareness to purchase decision. It’s a planned out marketing system, whose “steps” are made up most often of landing pages, blog articles, and emails. You can copy this attitude and get obsessed with “making funnels”… which in reality is not what you think it is. This is because you’re building “campaigns” that you’ll probably launch once. That’s because after a real funnel is launched, you maintain it and optimize it to work better over time. 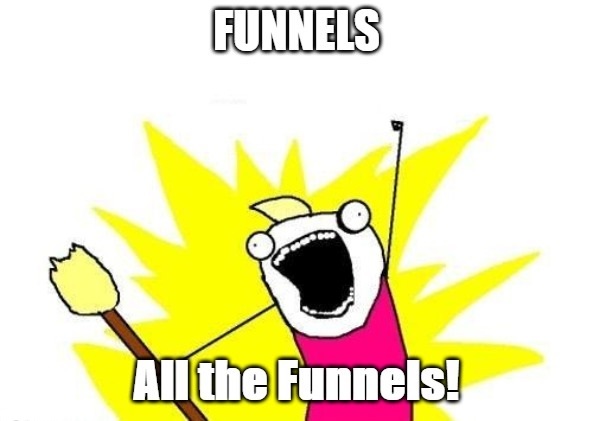 Want to manage 20 different marketing funnels? Realize that your business, like all businesses, only needs one primary sales funnel that works. Then you can build mini marketing funnels (or campaigns) that feed into it, like tree leaves and branches growing out from the main tree trunk. If the idea of a sales funnel isn’t so clear, don’t worry. I’ll define it more coming up. You can also browse some of the website sales funnel examples I put together here. Now you know what digital marketing and sales funnels are. You could bridge those definitions for a better understanding. You could say that digital marketing is the process of creating, “fueling”, and optimizing your business’s online sales funnel. This makes sense when you realize that all marketing elements fit into one of the three stages of your sales funnel. These sales funnel stages are universal to all businesses and websites. Understanding them gives you a mental framework for growth later on. 1. Top of the Funnel — This is where traffic flows in. This is the entry point, and it “fuels” or activates the rest of the funnel, leading to a sale or a lead conversion. SEO — This is where you optimize your website or content so potential customers can find you on Google and other search engines. Content Marketing — This is where you publish content in the form of blog posts or guest blog posts. It educates and/or offers valuable info to people in your target market, and overlaps with SEO. .
Ads — Search ads, banner ads, social media ads (like on Facebook, Instagram, Pinterest, YouTube, LinkedIn, Twitter, etc.). Social Media — This is where you drive part of your audience or fans from your social media profiles (e.g. Facebook Page) to your website. Email Marketing — Sending marketing emails with links that drive people to your site. This is for people who already opted-in on your website, but who haven’t become a customer yet. 2. Middle of the Funnel — Prospects (website visitors) get some information or content. Then they “engage” by clicking, opting-in, or, in some cases, making a small purchase < $50. This moves them into the next stage for the funnel. Copy — Any text that sells and persuades; it goes on your landing pages and CTA buttons. Landing pages — The goal of the pages of your website is to convert. They move strangers into becoming email leads, client leads, and/or buyers. Lead magnets — This is an incentive to opt-in to your email list. Something as simple as a newsletter or checklist, or as detailed as an ebook or multi-day email course. Call-to-action buttons — Buttons on all pages with a conversion-focused copy. When clicked it leads the prospect to the next step in the funnel. Optin Forms / Widgets / Pop-ups — Forms that capture contact information. In most cases, the shorter the form the higher the conversion rate. This I learned from 313 case studies while creating Proven Sales Conversion Pack. Thank You pages — These are a type of simple but important landing page. They work to comfort customers or clients who have just converted (into a lead or customer). And these offer thanks, reassurance in the form of confirmation, and details on the next steps. Email nurturing — Email nurturing or email / marketing automation focuses on selling. These are automated emails sent to nurture and grow the relationship with potential clients. The email content in this stage is education in nature. 3. Bottom of the Funnel — This is where you convert customers on your primary offer. Then you work to keep them as a customer over the long term. If you sell services, this stage is where prospects convert into a lead, and ultimately a client. Chat widget — A chat feature embedded on your site, especially on landing pages. You can address feedback, objections, or questions from potential customers or client leads. Consultation — A phone call or in-person meeting that leads into a purchase decision. Here the product or service is demo’d, and/or questions answered. Booking widget — A software tool for booking appointments and consultations with clients. It’s embedded or linked to on your site. Checkout pages — If you sell products you need a dedicated page (or on-page pop-up) for customers to buy. Segmented email follow-up — Email series sent to potential customers based on their interest. E.g. filled out a “watch demo” form vs. booked a consultation. Retargeting — Inexpensive ads that “follow” people around the website. They are based on a key page they landed on, and work off-site to nurture prospects into the next step of the funnel. This is a clear overview of the sales funnel’s stages and what goes into each. AB testing — AB tests improve your conversion rate (the rate at which people take action on your website or within your overall funnel). 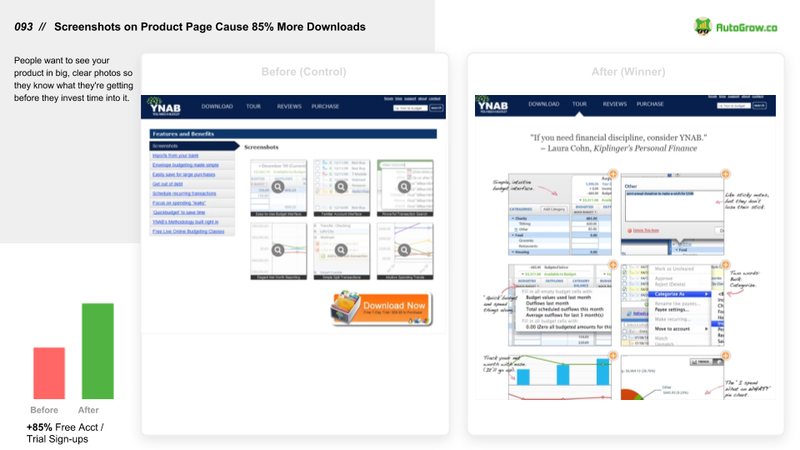 It lets you test two versions of a landing page (or pop-up, or an email) against one another. With AB testing you can be statistically certain your change increased sales, leads, or email optins. Upsells — An upsell is an offer on top of an offer that has already been made. It can be an upgrade to something more premium or a complementary add-on. The word is often used interchangeably with “cross-sell”. Social Proof — This is not mutually exclusive to any stage of the funnel. Most businesses don’t have it, don’t have enough of it, or misuse it. These all may sound like “a lot” to you, and I totally get that. You don’t need to get all these done overnight. Check out my checklist coming up for how to prioritize each element of your digital marketing funnel. 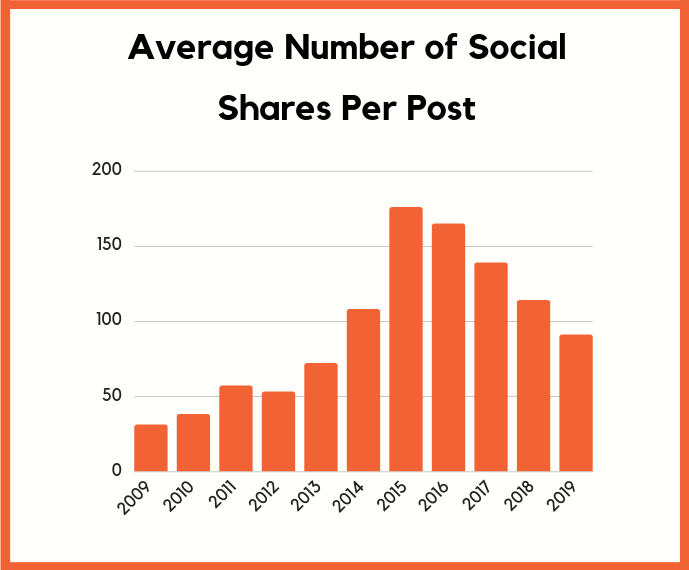 According to data Shareaholic, traffic from social media peaked in 2014. It is now is decreasing, and traffic from search engines has outpaced it. This is also supported by recent data from Neil Patel (see my introduction to this article above). That graph shows social media reach dropping over from 2015 into 2019. Idea: Email marketing has the best ROI of any channel. 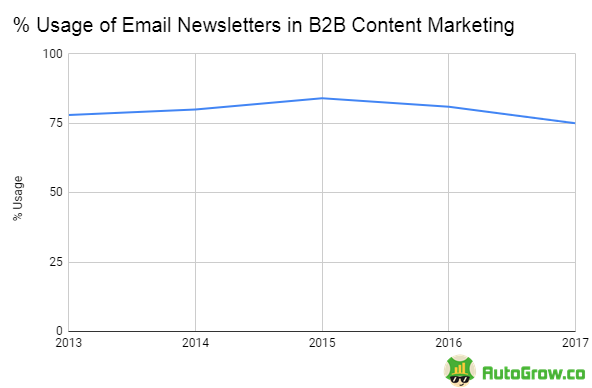 Trend / Reality: Some data trends from Content Marketing Institute show email may be plateauing, yet email (and relevance) is king. 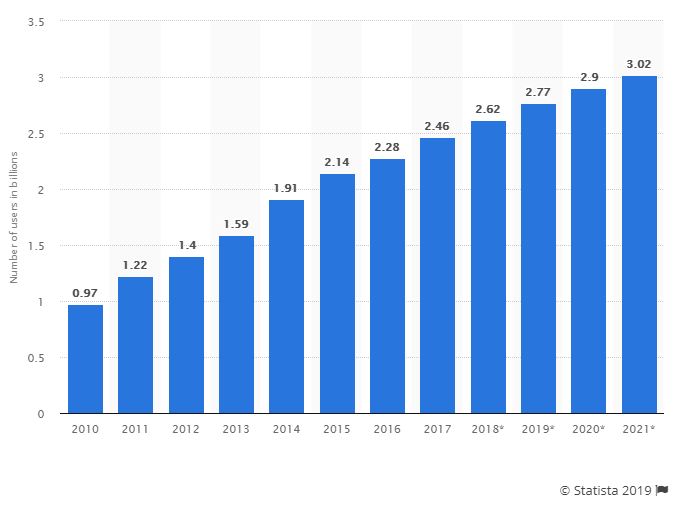 Email marketing usage is expected to increase in 2019 and beyond. Meanwhile, trust in social media as an effective marketing channel is decreasing (see data graph in the previous section above). According to a survey by MyEmma, 59% of B2B marketers reported that email is their most effective channel in terms of revenue generation. Still, as direct-marketer Frank Kern has mentioned in recent videos, and as I observed in 2018 within our own email funnel, email effectiveness may be peaking. The solution is segmentation. In other words, greater targeting of messages, content, and offers to your audience. Idea: Ads are the fastest way to grow your traffic. 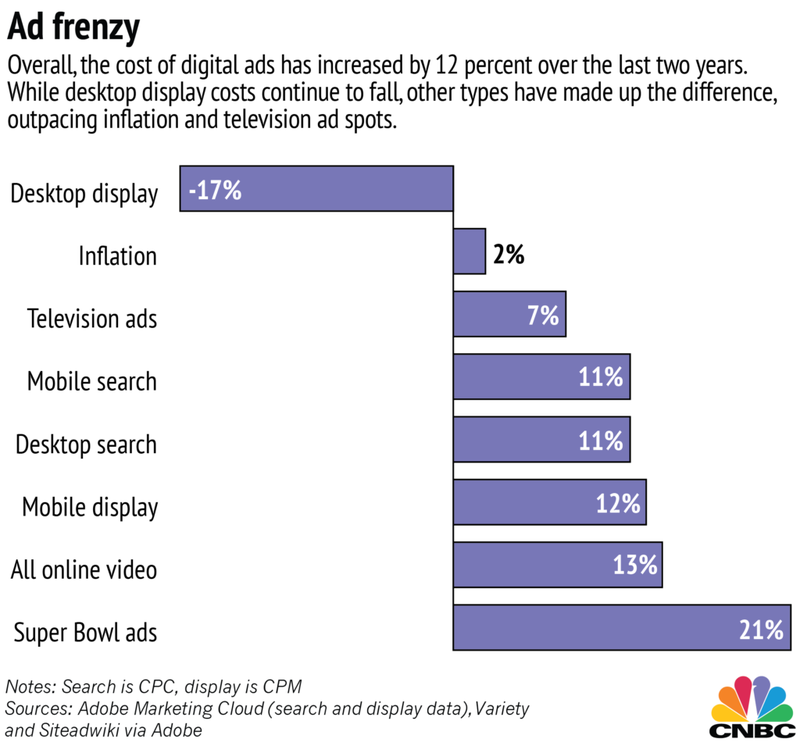 Trend / Reality: Ads grow your traffic fast, but they consistently get more expensive. Idea: SEO provides a continuous flow of traffic. In a 2016 study from market research company, Ascend2, 82% of businesses reported the effectiveness of SEO is rising and 42% said the effectiveness is increasing significantly. 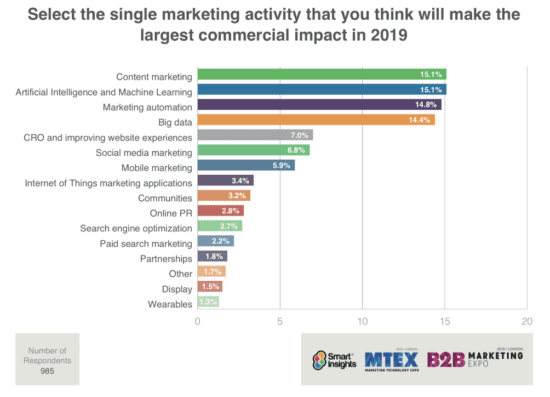 In a 2019 survey of marketers and business owners by Smart Insights, content marketing (which overlaps with SEO) was ranked number #1 out of 15. Meanwhile, traditional SEO (i.e. link building / on page optimization) was ranked #11. 83% of agency content marketers report their organizations have used content marketing successfully over the last 12 months (see page 33) to create brand awareness. If it wasn’t for content marketing I would not have been able to scale our 3 professional services lead gen funnels in 2010, 2015, and again in 2017 to 6-figures in revenue. This is thanks in large part to our rising organic traffic. In August last year, we crossed 40,000 monthly visits, a milestone. If you join our newsletter, I’ll be providing ongoing, exciting updates on our traffic progress since then. Bottom-line: I bootstrapped AutoGrow.co from zero and continue to use content marketing today to drive almost all our traffic. According to a recent survey by Smart Insights, segmentation (80%) remains the highest priority and technique used by email marketers in their campaigns. In other words, if you subscribe to our newsletter, I also ask what your biggest marketing challenge is right now. This helps ensure that I send you the most relevant content according to your marketing needs. Conversion optimization doesn’t require you to have a ton of traffic before you can start doing it. Doing it can be as simple as looking at your stats and adjusting accordingly. Or surveying or talking to customers who visit a specific page, and then tweaking the copy based on their feedback. For instance, A/B testing an idea I got from creating our Proven Sales Conversion Pack product, grew sales for our most popular product by 50%. According to an ongoing industry survey by ConversionXL, AB testing’s importance (and effectiveness) has continued to increase over the previous 3 years. Want a reference copy of this digital marketing guide in PDF form to grow your business? Click here to download the digital marketing guide and 11-point checklist. Cognito forms — Collect leads, create a contact form, convert email subscribers. Leadpages — Build landing pages that convert, deliver lead magnets, and sell, without coding or hiring a developer. SamCart — Checkout pages for selling digital products or productized services. No coding necessary. ActiveCampaign — Send newsletters and create segmented, behavior-triggered email campaigns that drive traffic, leads, and sales. Google Analytics — See traffic numbers for your website, what people do, and why they might leave. Google Trends — Helps with basic keyword research. Google Keyword Planner — Helps with more detailed keyword research. Zapier — Automate your marketing apps and workflows by connecting them together and setting up triggers. 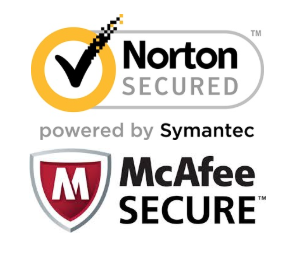 Cloudflare — Speeds up your website, prevents malicious attacks. Stripe / PayPal — Process payments online. BrowserStack — Test your website to make sure it looks good on all devices. This is a quick list of digital marketing tools to check out. I’ve used each of these for our business, daily in most cases. By the way, most of these are free, or very affordable in terms of pricing. For more digital marketing tools, check out my previous article on sales funnel tools here. 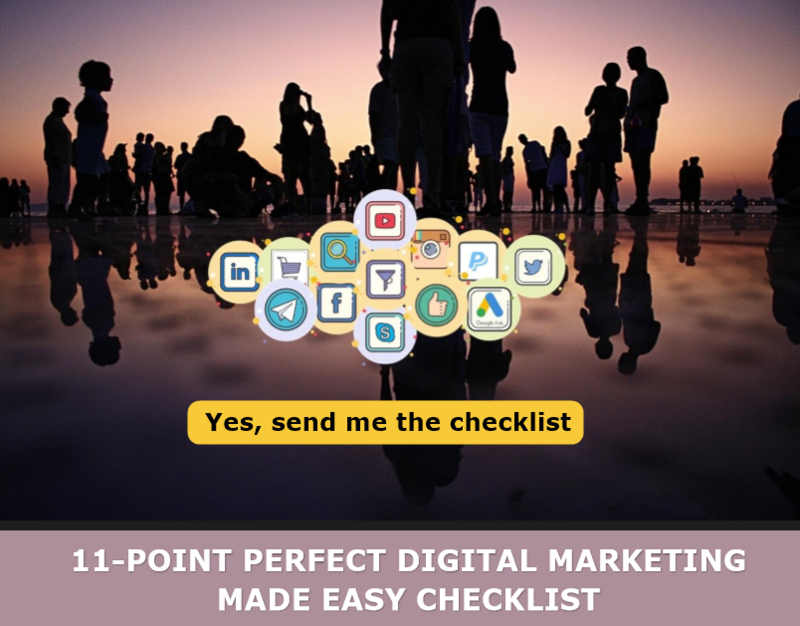 Finally, here’s my 11 point perfect Digital Marketing Funnel Made Easy checklist. Each stage of your digital marketing funnel listed in order of priority. If want to download a full copy of this checklist and article for future and offline reference, you can click here to grab your copy. It’s free. Prioritize all the elements in here first. With the Foundation and Follow-up built, it’s time to turn on traffic. Execute a content marketing strategy to target your niche. Also create a sustainable source of traffic for your site. With traffic flowing in, tweak, grow your conversion rate, and amplify traffic. That’s the priority overview, and here’s a more detailed look at the key steps to getting set up. Start with what matters: the landing page for your primary service offer. Craft your “Service Slice” for service professionals, agencies and freelancers. If you sell products, this would be your “tripwire.” This is a low-dollar (not low-value) entry-level offer, aka a tripwire. Back when I was running AutoGrow.co as an agency, we’d sell thousands of dollars a month in “service slices.” This put money in the bank. It also qualified prospective clients as truly interested. Develop a lead magnet that converts 30-50% of all prospects. Sound too good to be true? It’s easier than you think, but not always so obvious. Set up other critical pages on your site, like an automated booking page to capture qualified leads (if you sell services) and an about page. People trust credible-looking websites, NOT funnels. Make a hypothesis and set up an effective A/B test right out of the gate. Test your 3 key offers: the core landing page offer for your service, the lead magnet, and the Service Slice. Choose the traffic source that will fuel your funnel. 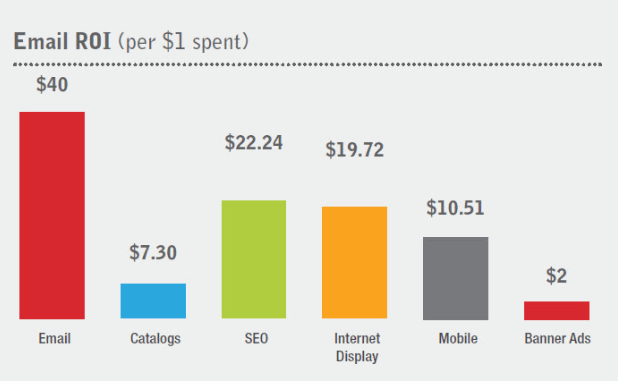 Search traffic: it’s the source that gets 3X more ROI compared to paid search ads (source: Kapost/Eloqua). Minimize lost leads with automated follow-up messages that educate potential clients. This works because it persuades prospects when they are on the fence. Share your message with the right people. Promote that content without spamming or annoying anyone. Track results to identify bottlenecks. Lengthen the funnel to maximize the value of email subscribers and client relationships. Use a proven growth framework. The above checklist is a preview. I go into much more detail in the PDF version (digital marketing for selling services). Click here to download a copy of it now. Or, in the checklist version for selling products. Click here to download a copy of it now. The following tips are based on my 12 years of experience as well as my more recent investment of 150+ hours analyzing 313 winning conversion case studies. “Minimal effective number of form fields” — In other words, less fields usually means more conversions (leads / sales). Increase visibility for your most important lead generation landing page — If people don’t see it and know about it, they won’t ever become a client. Grow your email list faster with a (better) lead magnet — Weak lead magnets that poorly designed, written, or that contain typos or one of the top conversion killers for small and growing businesses. Use authentic social proof — I wrote a detailed guide on social proof recently. The main idea with this tip is that people need to believe your testimonials came from real people. They shouldn’t “feel” anonymous and they should sound robotic. Trust badges — These make your brand look more legit and make potential customers feel more comfortable. AB test your checkout page — Consider AB testing a different checkout page design, like one that prominently shows security badges. You want to especially consider testing the text on your buy button. Risk reversal — For example, including a money-back guarantee on your sales page and checkout page. 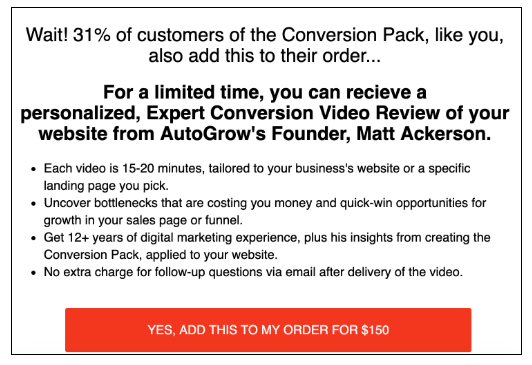 If you want more ideas that are proven to grow your conversion rate, check out the Proven Sales Conversion Pack. If you haven’t already, I encourage you to download this guide and the checklist. You can use it anywhere offline to grow your business. Click here to download the digital marketing guide and 11-point checklist. Digital marketing is the process of making people aware of your product or service. Then moving them over time into becoming a lead, and later a customer or client. A sales funnel is the best framework for thinking about growth and keep all the ingredients organized. Be aware of key trends that are shifting the digital landscape and will have an impact on how you do market online. Content marketing, segmentation, and conversion optimization are still proven strategies for growth. Use tools to save time and get your digital marketing funnel up and running faster. Download my 11 point digital-marketing-made-easy checklist if you haven’t already. I shared a preview of it above but I go into much more detail in the PDF version. Finally, if you’re looking for digital marketing tips that are “quick wins” use the list above based on whether you’re selling a product or a service. What’s your biggest challenge with digital marketing? Is there a specific tip or insight that stood out to you from this guide? Leave a comment to let me know. I’d love to hear from you.